Last weekend I had my last twenty miler of three in this training schedule for the Monumental Marathon. Since I was going to be up north at the cottage, and the Fall colors were fantastic, I decided to take along my camera so you get an idea of the beauty Gaylord has to offer in the Fall during peak color. Here's a look at the somewhat hilly elevation with a large hill right in the middle. I started out at about 8:00am and finished in less than three hours - it was a good run. As I started, the sun was still coming up. The following picture is right from the end of my driveway. I actually pass three golf courses for this run as there are three within 4 miles of my cottage including Michaywe Golf Course, Mountain Lake and The Loon. Gaylord has numerous golf courses in the area and most are really very nice. The picture below is of the Mountain Lake golf course as the sun was just coming up over the pond and it's one of my favorite areas to photography all year but it's especially pretty in Fall. This is also Mountain Lake below but just another part of the course. As you can see, the colors are incredible and it was a really nice, cool day with temps starting in the high 40's and ending in the mid 50's. Another mile down the road is the Loon golf course. As I continue, I finally made my way back to the front of the subdivision which is about 4 miles from my place. Otsego Lake, one of the largest lakes in the area, is almost five miles and it also has a spectacular view. I've actually ran from my place, entirely around Otsego Lake and back for about a 22 mile run but was not interested in doing more than 20 today so I did 10 miles out and back. Old 27 runs along the lake and it's got some hills on it as well. It's a fairly busy road but, at this time of day, it's not too bad with cars. 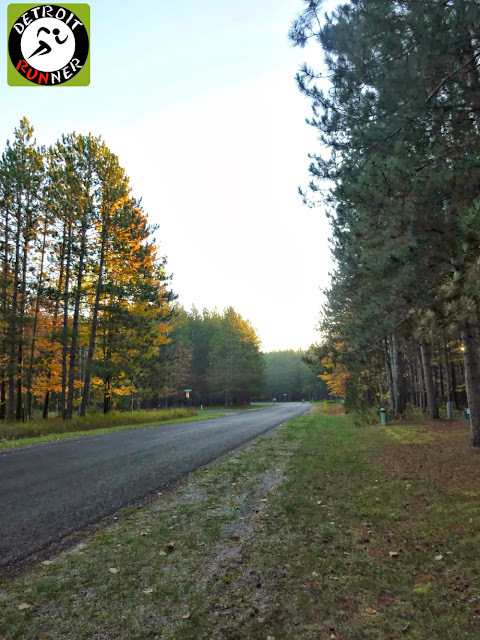 I made the turn onto Mancelona road which is at the end of the lake to make my way partially around the lake and was greeted with some great color on this great road. I love the bends on this. Another turn takes me onto Otsego Lake Road and I'm greeted with more hills. My turn around below took me over a hill, the largest I ran today, which I had to run back up again. With the great colors, though, it felt easier than normal. I do enjoy the out and back run as you really do get a different perspective even though you cover the same road twice. This is on my way back on Old 27 again by the lake. As you can see to the left, you can also run on the snowmobile trails too which I did part of the way so I was not on roads 100% of the time. Back to the gorgeous view of the pond and Mountain Lake, it turned out to be a fantastic day for a long run. Mountain Lake; I can't remember what hole this is but I know I've lost a view golf balls on it. I continued along the road as I'm almost back home. There was a variety of colors and being back in my subdivision is nice since there is not much traffic to worry about. Another turn and I'm back on my road. As you can see, there are lots of pines in this area which is mostly what is on my property in the front with some hardwoods in the back. Finally, my day is complete and I've accomplished my final 20 mile run. I'm happy to say that I didn't do much after that as the run pretty much wore me out so I was happy I was up north where I could relax the rest of the day. Gaylord, Michigan really is a great place for a visit whether that is for Fall colors or for a round of golf in the summer or to snowmobile in the winter. There's plenty to do or you can do nothing but hang out. As has always been my opinion, it's prettiest for the fall colors in the second week of October when things are at peak color. Perhaps think about visiting next year to see it. It's worth a weekend trip up to see the colors and go for your own run. So beautiful! Must have made the 20 miles go by a little bit sweeter :) I love the Gaylord area. We spend time a touch north in Indian River. What great views on a run! Another great post loaded with beautiful sights. What a great place to run your 20 miles. Thanks for sharing the awesome views! While you run your last 20miler I'm thinking about a first (for the next marathon), and like you I want it to be beautifull so the miles will pass easy! I'm now looking forward to your marathon as much as you!!! Love it when the training is gone!!! Wow, love all the fall pics. I'm excited to find out what you think about the Monumental. I love Indy and this is one of my most favorite marathons I've done. Plus, I saw the race shirt this year and it's awesome. You should really enjoy that fast flat course! Get some rest now and get ready! Christmas Story Virtual 5k/10k meetup? A change of seasons - what's your favorite? The Mustache Dache and Entry giveaway!!!! Next up....Sleeping Bear Half Marathon! !